Although best known for his career as a baseball player for the San Diego Padres from 1979 to 1989 and as a coach after that, Tim Flannery could change what he's known for if he continues to release albums as superb as Pieces of the Past. 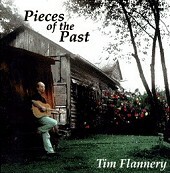 For this third effort Flannery decided to honor his Irish-Kentucky-Cherokee ancestry resulting in a stirring collection of rootsy Appalachian flavored folk tunes with an Irish flair and bluegrass elements all led by his warm, emotional vocals and fleshed out with stellar musicianship (contributors include Kieran Kane, Steve Poltz and Bruce Hornsby). Flannery completes the package with a CD booklet full of family photos covering many generations and wonderful liner notes.